Although I’ve found myself acknowledging fewer holidays in my classes over the years, many students are still looking to make connections to some of the more popular holidays. Halloween is one. 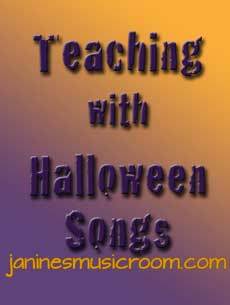 Last year I wrote about a silly song you could sing with your students, and in this post I want to highlight a few other songs that could fit into your curriculum. In Music, this is a great time of year to explore that beautiful instrument known as the human voice. Do some vocalizing through ghostly wails. Practice dynamic range with sneaky monsters and surprised victims. Explore the different timbres of the voice, and discuss the incredible effects of changing timbres, dynamics, and pitch ranges. For younger children, try this book. Finally, check out this post or this other post for some great classical music ideas to accompany the season of ghouls and spirits.